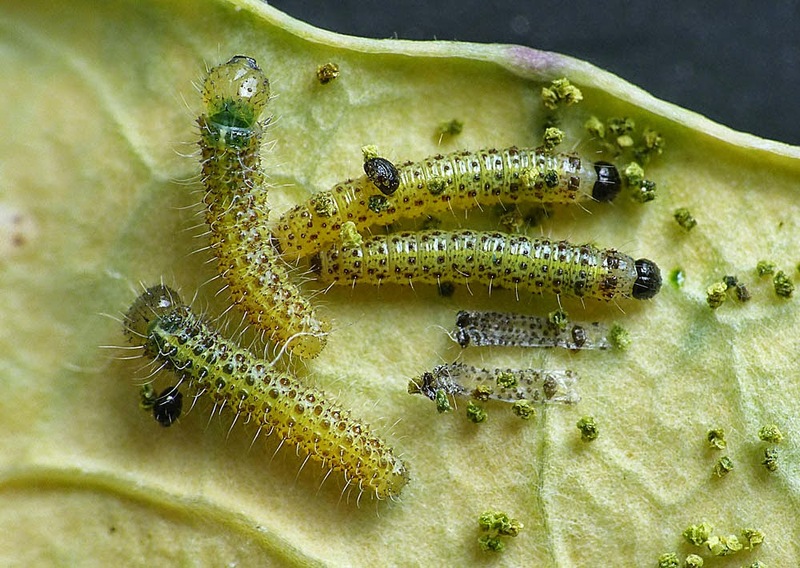 58.006 Large White eggs on Broccoli, Skircoat Green allotments, Aug.4th 2014. 58.006 Large White eggs as above and also photographed the same day. 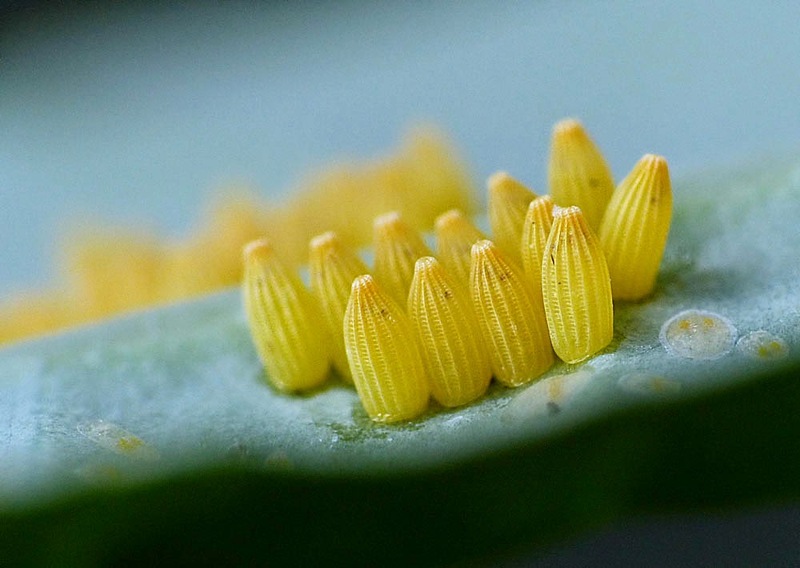 As they begin to colour up hatching is imminent. 58.006 Large White, 2nd instar larvae with shed skins and head capsules - three days after the above eggs hatched. 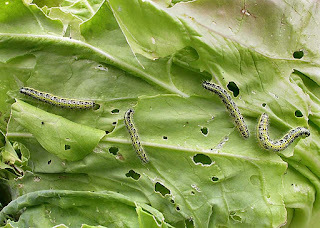 58.006 Large White larvae on cabbage, Skircoat Green allotments, June 28th 09. 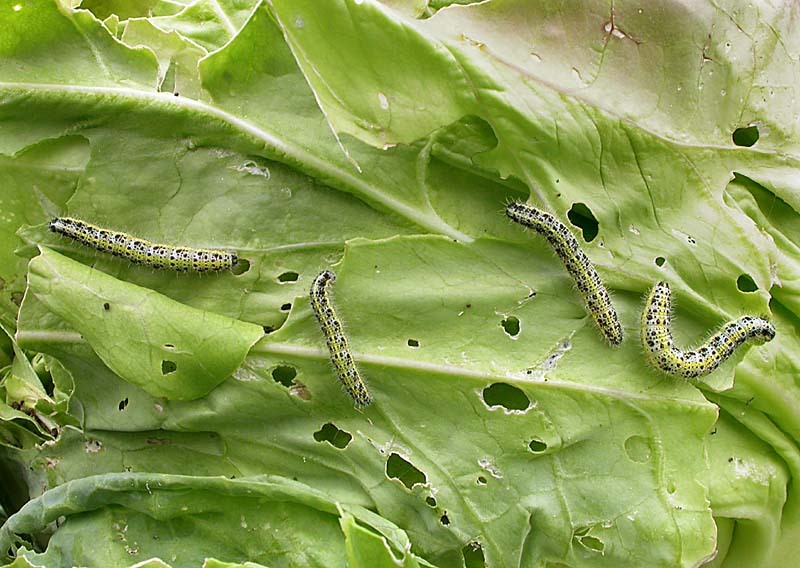 These are not really a pest as they only nibble the outer leaves and are not nearly as destructive as Wood Pigeons - besides, who eats a whole cabbage anyway? 58.007 Small White egg on kale, Skircoat Green allotments, May 7th 2011. Taken through the eyepiece of a 20x microscope. 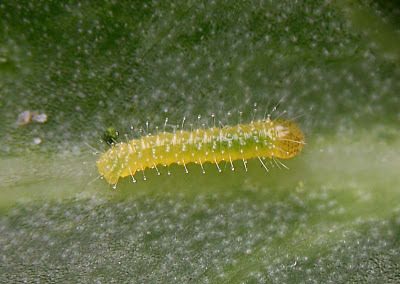 58.007 Small White, newly hatched larva at 2mm long, May 7th 2011. Reared from an egg, details as above. 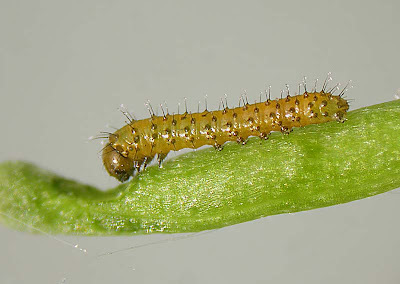 58.007 Small White larva at 3 weeks old, May 28th 2011.Reared from an egg, details as above. 58.007 Small White pupa, June 5th. A silk pad secures the rear end to the substrate as does a silk girdle around the middle. 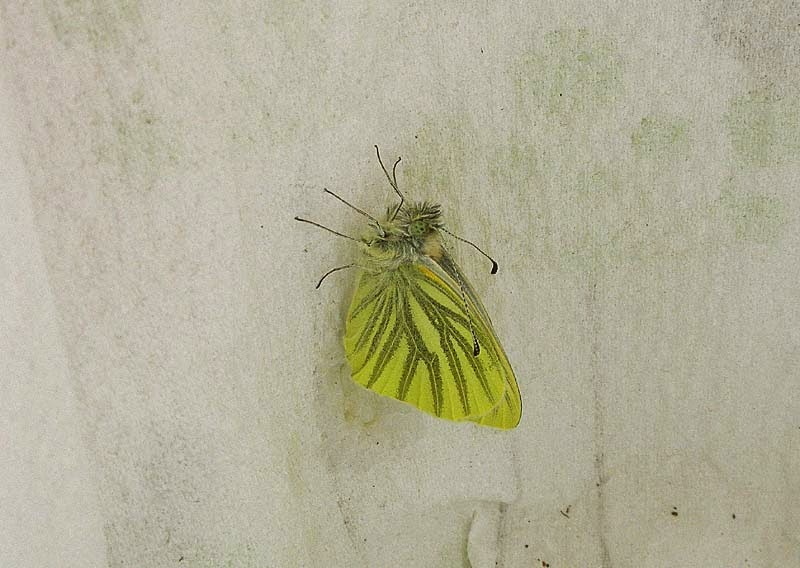 The wing pattern becomes clearly visible through the now transparent pupal case shortly before emergence. 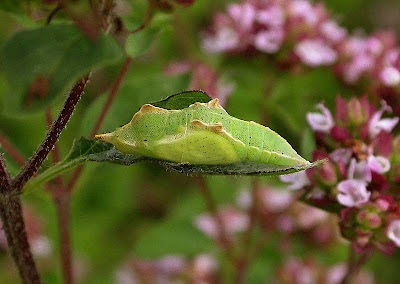 58.007 Small White pupa on Marjoram, Skircoat Green allotments, Aug.14th 2012. 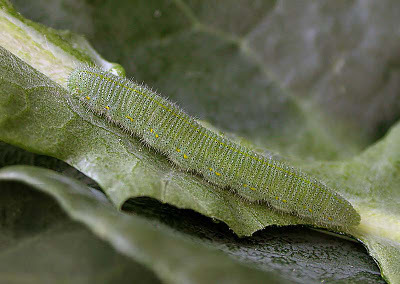 As usual the larva has wandered before finding a suitable place to pupate, in this case probably from the nearby Brussel Sprout plant. 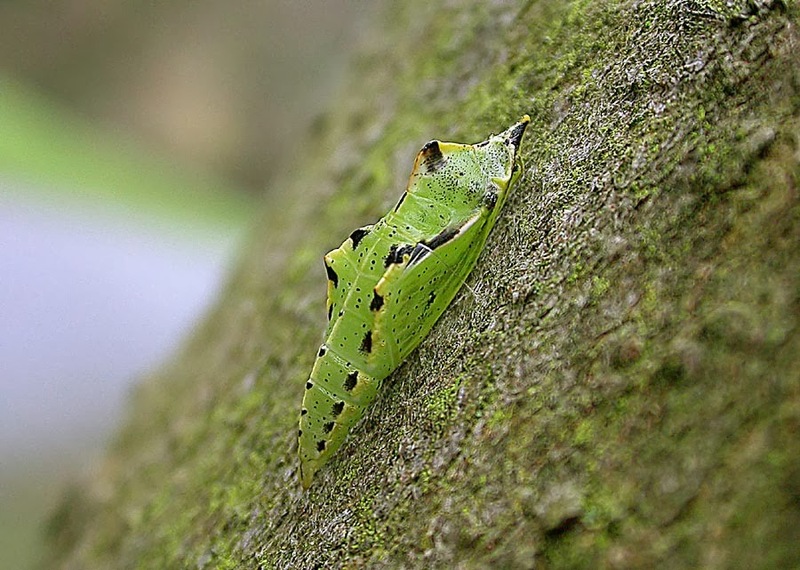 58.008 Green-veined White pupa on a Sycamore trunk, towpath at Copley, Jan.1st 2014. I believe it to be of this species but I will try and remove it from the trunk and rear it through just to make sure (see below). 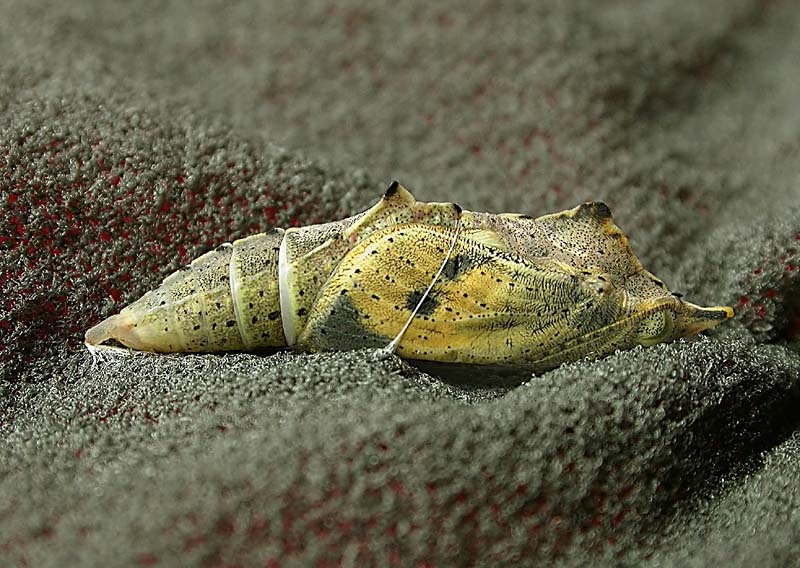 58.008 Green-veined White pupa (details as above). 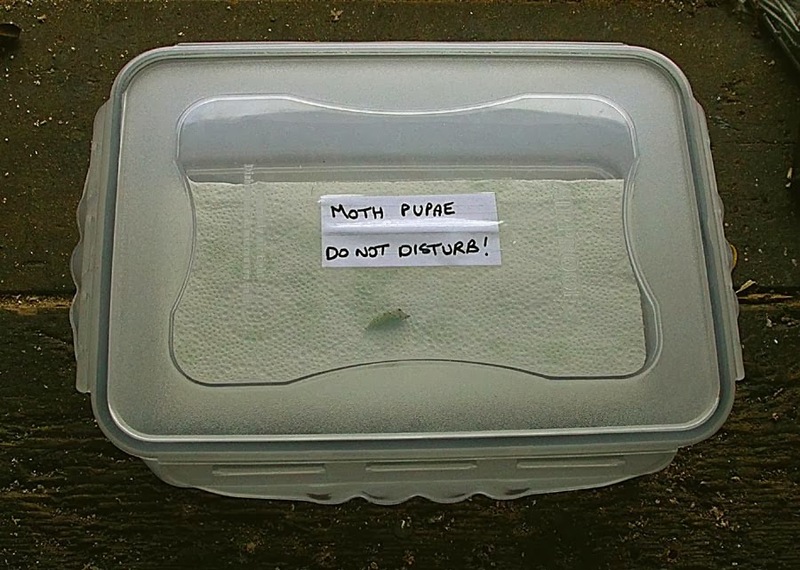 As I haven't really done any mothing in the last 12 moths the pupa cuts a lonely figure in the rearing tub which is left in the garage over winter. 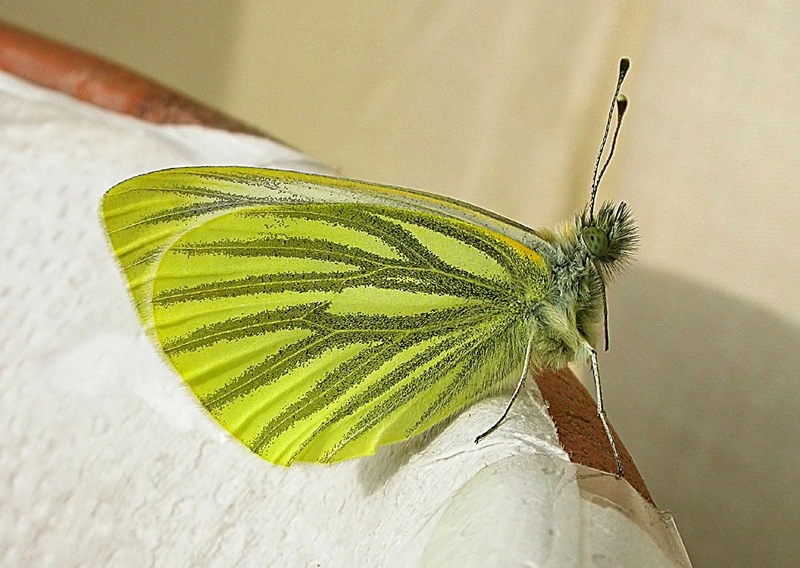 58.008 Green-veined White Mar.14th 2014. 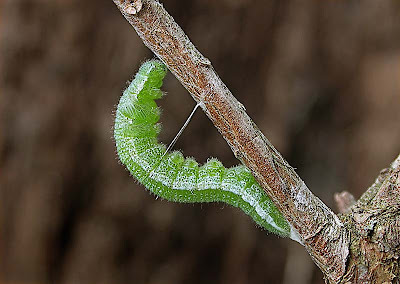 Reared from the pupa illustrated above. 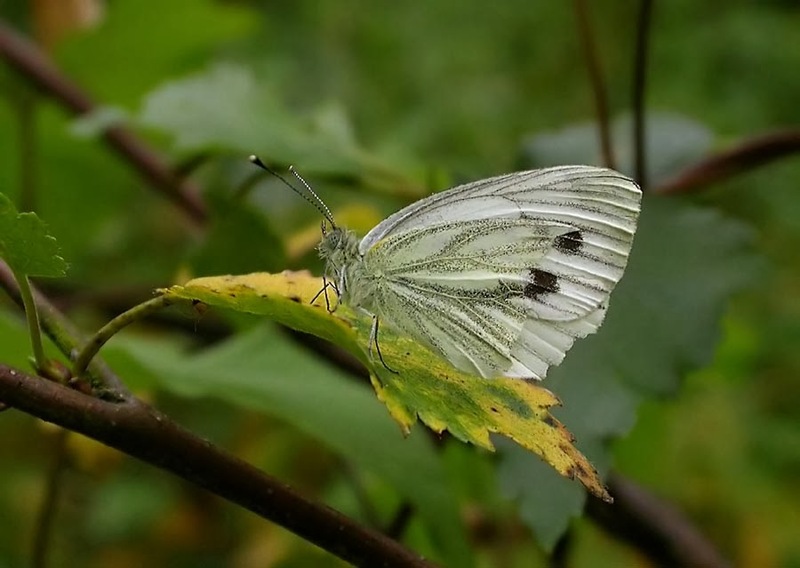 58.008 Green-veined White Mar.14th 2014. Another shot of the butterfly above resting on top of the flower pot the pupa was in - not a scale out of place! 58.008 Green-veined White, North Dean meadow, July 21st 2006. This one has a damaged hindwing allowing the dark spots of the forewing to be visible. 58.003 Orange-tip egg on Garlic Mustard, next to the tow path at Copley, May 14th 2011. 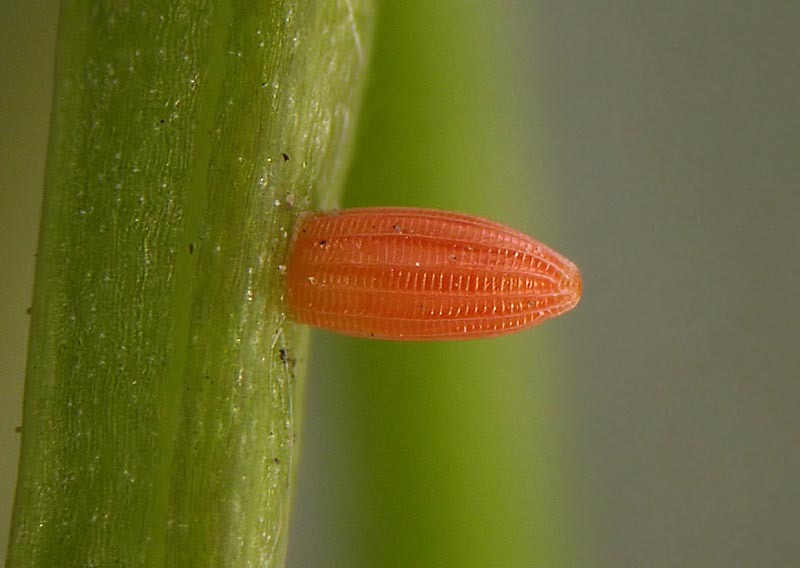 Although tiny, the bright orange egg is quite visible and is one of the easiest of all butterfly eggs to find. 58.003 Orange-tip egg, found on Garlic Mustard by the Calder at Milner Royd. May 9th 2011. Taken through the eyepiece of a 20x microscope. 58.003 Orange-tip newly hatched larva at 2mm long feeding on Garlic Mustard, May 11th 2011. 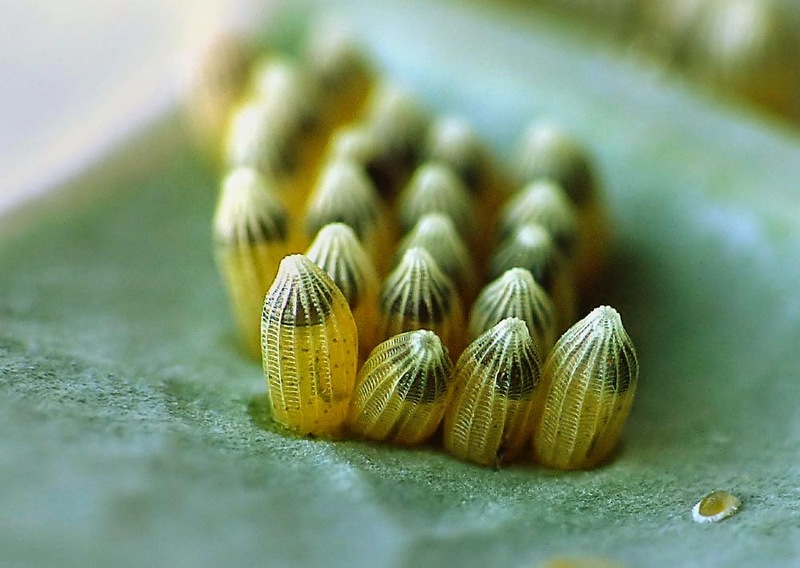 Photographed through an eyepiece of a 20x microscope. As with the newly hatched Small White larva above the hairs are tipped with a globule of liquid. For what reason I'm not quite sure. 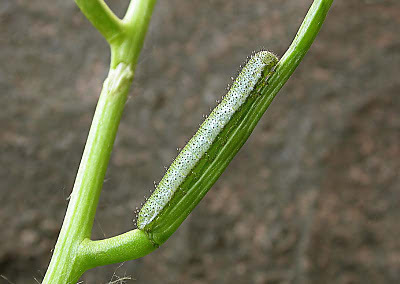 58.003 Orange-tip larva, May 20th 2011. 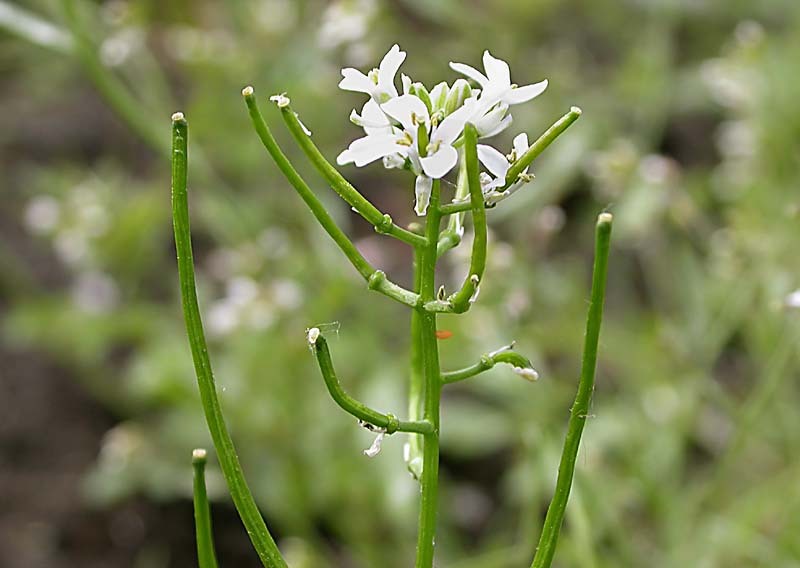 Nine days old and blending in well with the Garlic Mustard stem. 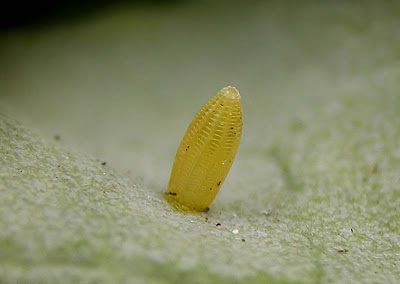 58.003 Orange-tip pre-pupal larva, May 27th 2011. A week on and the larva has spun a pad of silk at the rear end and a strand of silk around its middle to anchor itself the twig. 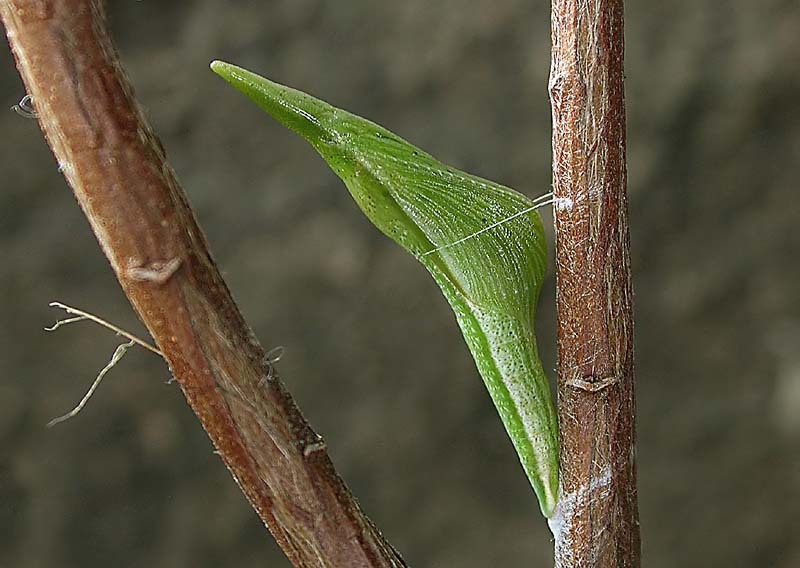 58.003 Orange-tip pupa, May 29th 2011. Two days later and an amazing transformation has taken place. 58.003 Orange-tip pupa (male), Mar.30th 2011. 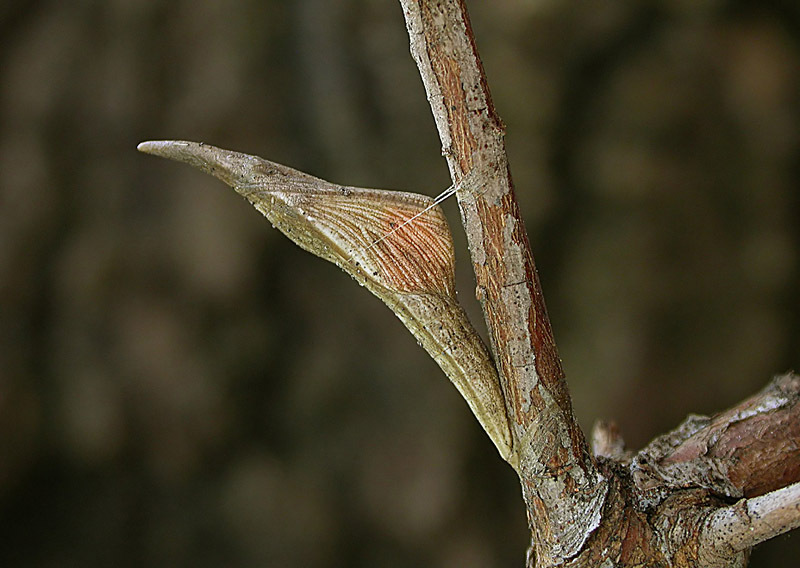 A much better camouflaged shade of brown now to match the leafless twig. 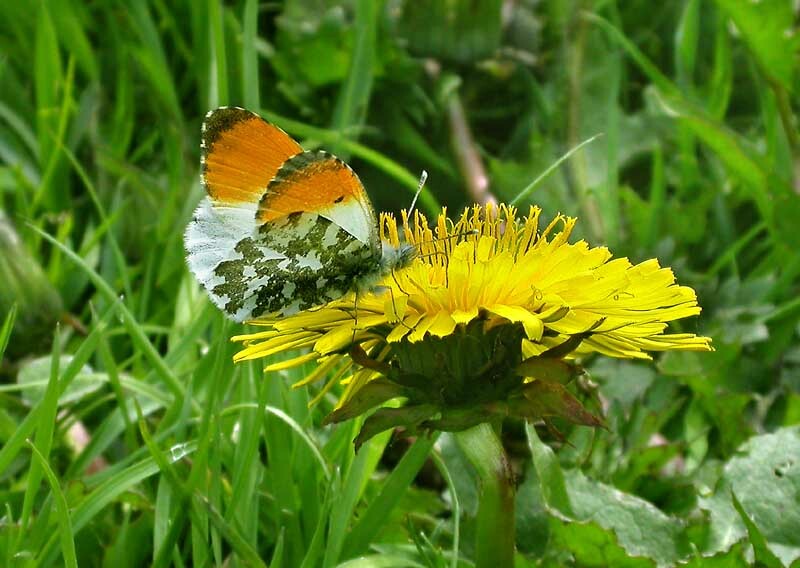 The orange tips of the wings are now beginning to show through. 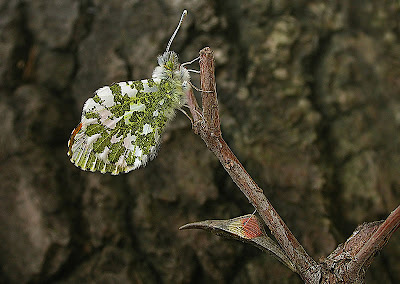 58.003 Orange-tip freshly emerged and a pupa close to emerging, Apr.1st 2012. 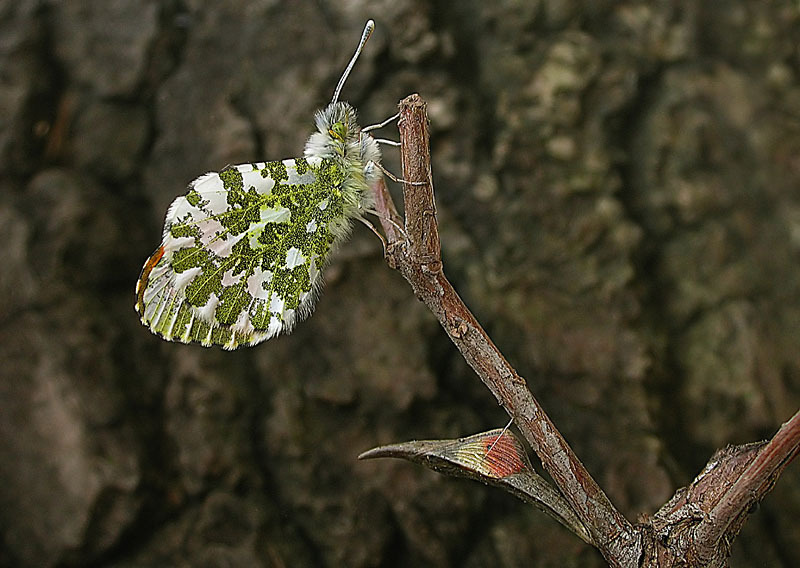 58.003 Orange-tip (male), the towpath near Elland by-pass, May 11th 05. Nectaring on Dandelion. YAHOO CHAT GROUPS FOR MOTH-ERS. Born in 1965 in the pennine borough of Calderdale, West Yorkshire, I take an interest in most forms of wildlife and enjoy trying to photograph them.